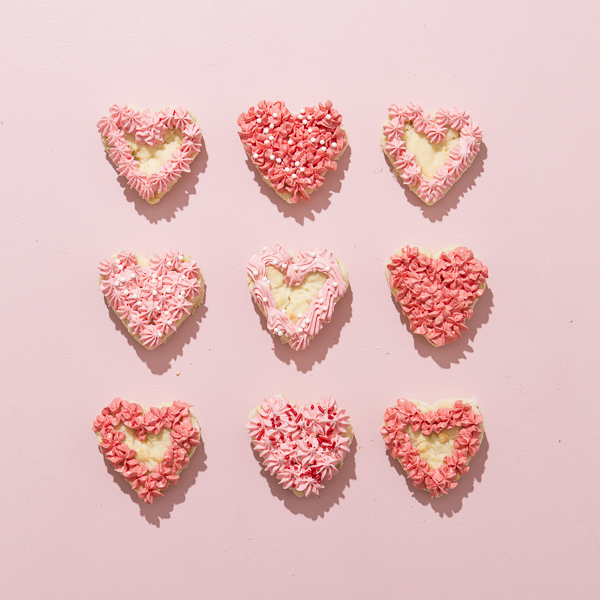 I think there’s always this slight epidemic when it comes to Valentine’s Day and that is the lack of chocolate-less desserts. I know the poster child for the holiday is an actual box of chocolate but I also know that there are chocolate haters and we can’t risk breakups over desserts! So I’ve gone ahead and made a dessert that’s milk or dark chocolate free (there’s white chocolate but that doesn’t count sshhhh). The good news is that you can also go the chocolate route with a new bunch of add-ins. This set is cool and casual with flakes of coconut and white chocolate chunks and could proooobably make any chocolate lover happy too. 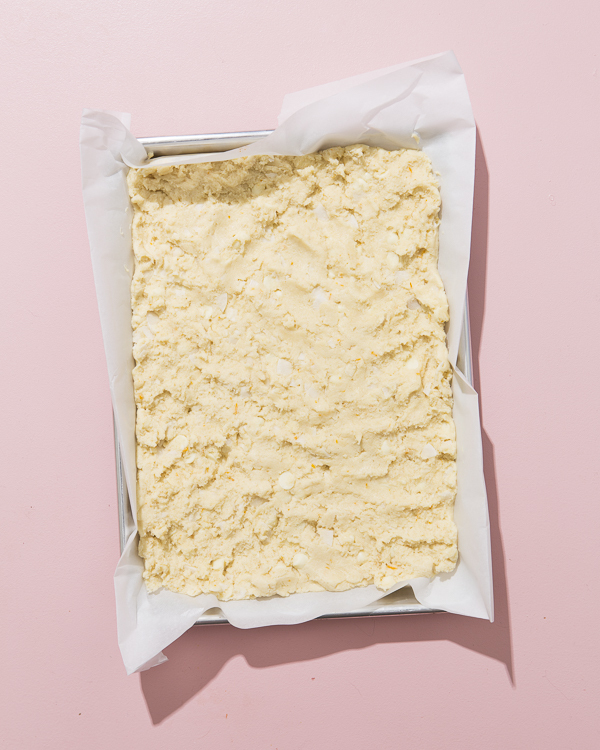 Start by preheating your oven to 350ºF and lining a 9×13” baking sheet with parchment (grease the pan that might come in contact with the cookie slab but if your sheet of parchment is large enough it’ll cover it all. In the bowl of a stand mixer fitted with the paddle attachment beat together the butter, sugar, vanilla, salt and meyer lemon zest until lighter in both color and texture, 2-3 minutes. Add in the eggs one at a time on medium speed, making sure the first one is mixed in completely before adding the second, then add the flour in two batches to make sure you don’t dust the whole kitchen with a layer of it. After the flour is mixed in add the white chocolate and coconut flakes and mix on low just until combined. Turn the dough out onto the parchment lined baking sheet and use your hands to spread it out evenly into the pan. Bake for 15-20 minutes, until the cookie is juuuuusst starting to brown then remove and let the whole thing cool completely before cutting into desired shapes and frosting. Beat the butter and salt in the bowl of a stand mixer fitted with the paddle attachment on medium speed until it’s nice and fluffy, about 1 minute. Sift in the powdered sugar, add the heavy cream, then mix on low until combined then turn the speed to medium high and beat for 1 minute until the buttercream is nice and fluffy. Add the food coloring if using and mix on medium high speed until combined. 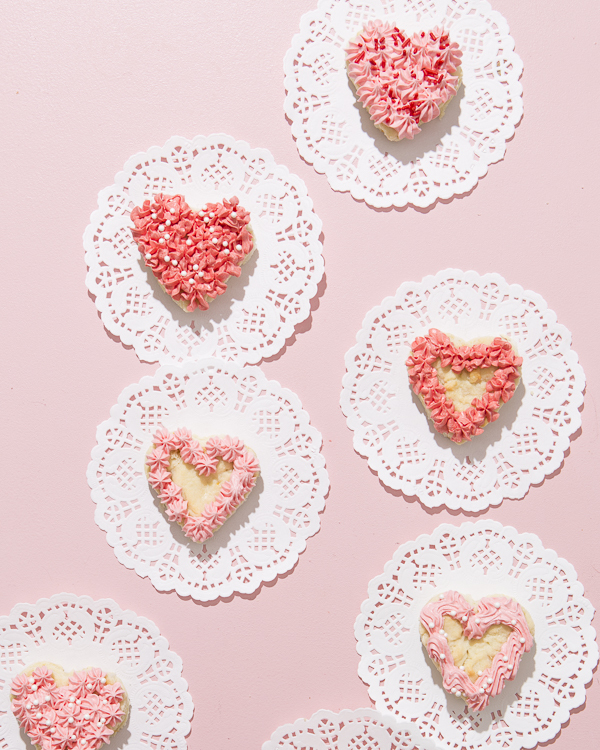 Spread the buttercream on each cookie or pipe it on a la Mrs. Fields cookie cake. Enjoy! These are so adorable and look so delicious! On Valentine’s Day majority love to go for non-chocolate cakes. People like other flavors such as strawberry more than chocolate cake. Oh my! These are ADORABLE and they look DELICIOUS!! 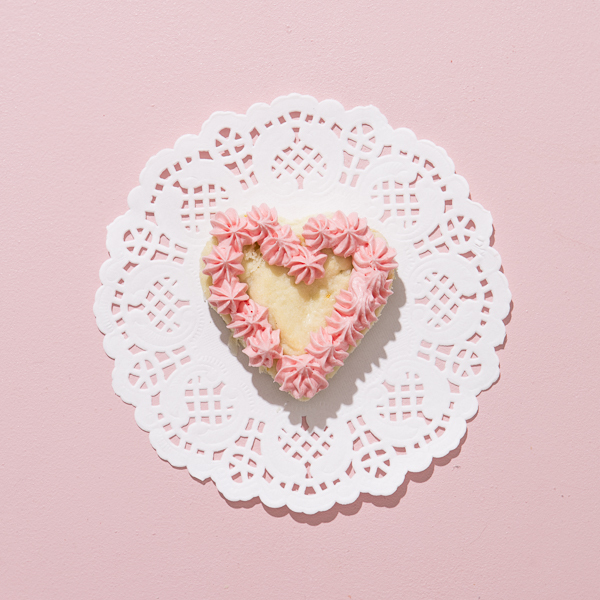 <3<3 Will most definitely be making these for V-day!